Many have told us that they are amazed by the grace with which we are walking through this tragic and painful time. I’ve heard it said that trials bring out your true character. I must admit that I am surprised at who I have been throughout this journey. Before this happened, I wasn’t always happy with who I had become. We had many unexpected changes in the past year; some had hardened my heart and left me bitter and unable to show grace easily. Add sleep deprivation into the mix and you have the perfect storm. These were mostly internal struggles – on the outside I was able to keep everything normal and in control. Lately, bitterness has been trying to creep back into my heart because of the actions of a few people who are choosing to take out their inability to deal with Tori’s diagnosis on us. The “who” isn’t important – it’s the “what” that matters, and I choose to share this in hopes that it will impact someone and they will choose to treat families like us differently. As if Krabbe weren’t enough to deal with, we are being forced to deal with irrational, selfish drama that makes no sense to us at all. People are making assumptions about us and they are wrong. Period. No matter how hard we try, we can’t seem to please a few certain people and it has caused so much additional stress and pain in our lives. Tori is our first and only priority. And yet, we still have so much grace in our hearts even in the midst of this pain and added drama. Brennan and I are SO far from perfect. We are human, we make mistakes. But I can tell you this: we are loving, kind, joyful, non-judgmental people. We are so thankful for every single note or gift of encouragement that comes our way. We try to acknowledge all of these things publicly but sometimes we forget in the midst of taking care of Tori. I wish you all could be a fly on the wall in our home, seeing what a day in our lives looks like, especially for me during the day when I am on my own caring for Tori. I do NOT say all of this for accolades or attention. I simply want to show that taking care of a baby like Tori is incredibly time consuming. I rarely get to do anything for myself, and I don’t mind at all (as long as I can shower! Tori appreciates that, haha). This is my calling in life and I fully give myself to Tori and her care. I wouldn’t have it any other way. Now that she has started to have swallowing issues, we cannot leave her unattended at all. She hates the car, so I rarely leave the house. We are working on solutions (including trying a new car seat), but for the time being we take her to the doctor and to church. That’s it. She likes planes and trains, not the car. While I try to post pictures of everything that has been sent to Tori, and while I try to put her in every outfit, it is a challenge. I fail. It is nothing personal, I promise. Tori has a huge pile of outfits that she has yet to wear! She has quite the wardrobe! 😄 I love posting pictures of her in all of the outfits that others have so generously given as a way to honor their gift, so I try my best to dress her in every outfit. But, some days Tori doesn’t let me take pictures. Sometimes she needs to stay in pajamas and be comfortable. 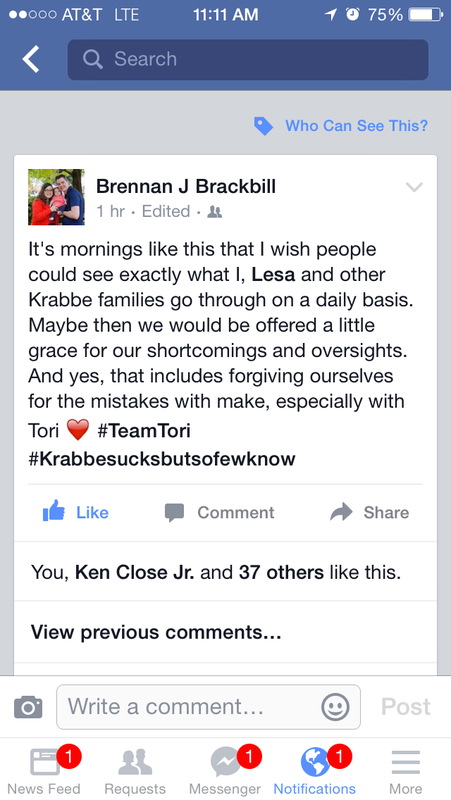 Tori is my priority, along with Brennan. I can’t believe that I even have to post this, but it is important to me that it be made known. I do not judge others, for any reason. I do not hold grudges, and I don’t like that people are spreading rumors about us that are absolutely untrue. Please don’t assume things about us. Don’t tell us we are wrong about things when only we really know our hearts. If you have a perceived problem with us, please come to us directly. Do not post passive-aggressive and vague statuses about us. Do not publicly slander us. Please. We don’t deserve this. We have enough to deal with and may need to start establishing boundaries for our health and well-being, and that makes us sad. We have chosen to surround ourselves with positive, loving, helpful people, and we will continue to do so. I’m sorry that not everyone is dealing with her diagnosis well. But I do believe that it is a choice to continue to show grace, to love her, to be part of her life as long as we have her. And it is definitely a choice to be sensitive to the needs and feelings of parents of terminally ill children. Grace and love abound in our home. Anyone who enters through our front door can see that. We do not intentionally leave people out or refuse to acknowledge things. Please show us (and other families like us) grace and love. It is the least you can do. Taking care of our precious baby girl is the most important part of our lives right now and nothing can or will change that. I have been learning a lot about grace in the past few years – mostly pertaining to how infrequently I offer it in my daily life. The book “Grace” by Max Lucado was eye-opening and I was so challenged by it when I read it a few years ago. A practical example? Most of my early driving years were in Southern California. Enough said. 😉 I am much better now in that area. I have found that patience and grace go hand in hand: for example, being willing to be patient with people is often a form of grace (think Bill Engvall’s “Here’s Your Sign” stories). I always try to remember that I usually don’t know the back story behind someone’s behavior or attitude and that helps me to be graceful toward them…usually. Do they deserve my patience and kindness? Yes. When I became a parent, I was amazed at how naturally patient with Tori I became (I now believe that God gives mothers an extra dose of patience and grace for their babies, especially given the sleep-deprivation that accompanies motherhood). Granted, she was also the perfect baby for the first four months and was rarely fussy or irritable. She didn’t sleep much, but she was at least happy about it. Throughout the past two months with Tori’s increased/constant irritability, decreased sleeping hours, and the added stress of a terminal diagnosis, I have had to make a conscious decision many times a day to show a new level of patience and grace toward her and the situation. She can’t help how she feels and she doesn’t have any other way of telling me that she is uncomfortable. I fully admit that the first two weeks of this behavior change were frustrating and I was not very patient. I assumed that the fussiness was simply a growth spurt or something like that, and, given that I haven’t had a full night of sleep in about ten months, its constant presence wore me down quickly. However, it is amazing how the word “terminal” can totally transform your attitude in an instant. Now, I recognize that a day may come when I would do anything to hear that cry again. To be up all night with her, as sleep-deprived as I would be. To comfort her and hold her. Just one more time. I pray that this lesson doesn’t fade away as quickly as it came, because it applies to everyone I meet and not just Tori. We have no idea how many days are left in our lives or the lives of others. We cannot imagine what impact our kindness and patience may have on someone’s hurting heart. And so, grace continues to be the primary lesson the Lord is having me learn thus far during this wonderful journey of motherhood. It is often accompanied by the lessons of selflessness, humility, and patience. And I am so thankful for the changed person I am becoming, even though the lessons aren’t easy. I never cease to be amazed at God’s perfect timing. In the past couple of weeks, I have realized (with God’s gentle nudging) that I have not been generous in offering grace to others in a few specific situations in my life. I have been quick to be critical, I have been self-righteous at times, and I have been slow to forgive. And then this book arrives in my mailbox…coincidence? “Grace” helps us explore the deeper meaning of the word as well as its application in so many areas of life: forgiveness (which is what I needed to read the most), humility, love, and many others. This is yet another book in which I have underlined quote after quote. Grace is not blind. It sees the hurt full well. But grace chooses to see God’s forgiveness even more…Where grace is lacking, bitterness abounds. Where grace abounds, forgiveness grows (pg. 61). There is something in you that God loves. Not just appreciates or approves, but loves. You cause His eyes to widen, his heart to beat faster. He loves you. And He accepts you (pg. 118). Rather than conjure up reasons to feel good about yourself, trust God’s verdict. If God loves you, you must be worth loving (pg. 121). Max uses Scripture and personal testimonies from people (including himself) to provide a compelling and powerful book on an incredible gift. It is so easy to believe the enemy’s lies that we are worthless, unloved, failures, and incapable of offering grace. But God’s Word says otherwise and Max Lucado leads the reader through Scripture to show exactly how God sees us. Max Lucado has yet again written a masterpiece…he is able to take difficult topics and break them down into tangible, meaningful explanations. Grace is something that people can wrestle with for years before fully grasping its power; this book can help. With his honesty, wisdom, and wit he is able to assist the reader with fully embracing the grace that God so freely and abundantly offers to us. God definitely used this book to soften my heart, and I know that it is one I will refer to over and over again. I can’t wait to do the Bible study at the end (12 weeks) to help me dig even deeper into the knowledge of God’s amazing grace. I received a free copy of this book from Booksneeze.com and the opinions expressed are my own.